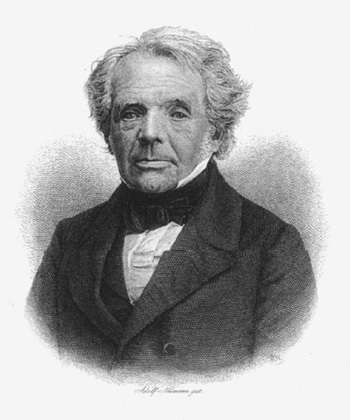 1790: Mathematician, astronomer and physicist August Ferdinand Möbius is born in Schulpforta, Saxony (in modern-day Germany). Möbius has name recognition today because of the Möbius strip, which is a clever topological surface with only one side and only one edge. Speaking of name recognition, Möbius probably pronounced the name something like MER-bee-oos (first syllable rhymes with her, but with the r barely spoken). Webster’s New World College Dictionary recommends pronouncing it MAY-bee-us or MOE-bee-us. But you often hear MEE-bee-us, and you sometimes see the alternate spelling Moebius. As for the Möbius strip (or Möbius band), many budding young topologists have discovered that it’s possible to create one of these seemingly impossible objects with nothing more than a long, narrow strip of paper and a bit of tape. Simply make a loop, but before closing it, give one of the ends a 180-degree twist. Tape the ends together. Then use a pencil to trace a path along the strip. You’ll see that you can start from any point and, without leaving the same surface, wind up on the seemingly opposite side. 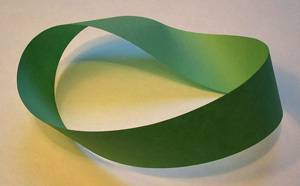 Cutting a Möbius strip lengthwise results in a longer, thinner loop with a full twist in it. It’s not a Möbius strip, but it’s interesting because if you then cut that loop lengthwise, you’ll get two interlocked loops, each of which has two full twists. Different kinds of twists and cuts can result in a wide array of interlocked rings and knots. It may take some advanced mathematics to understand why this is so, but it makes for an entertaining project on a slow day in your cubicle. A student of mathematicians Carl Friedrich Gauss and Johann Pfaff, Möbius is known today primarily for his mathematical and topological discoveries, including the Möbius function, the Möbius transform and the Möbius inversion formula, which are significant in number theory. But he also published important work in astronomy and celestial mechanics, and was for a time the director of the observatory at Leipzig. Sadly for Möbius, his claim to have discovered the Möbius strip is disputable: The lesser-known Johann Benedict Listing may have come up with the idea first. But Möbius usually gets better listing than Listing. Of course, if you wrote both names down on a Möbius strip, that might not be the case. Top image: August Ferdinand Möbius, by Adolf Neumann.